I found this article on Ontario Outdoor Magazine and thought it was worth sharing. When you think about it, our bow season is relatively short. Deer, bear, moose, small game, and turkey hunting opportunities are all compressed into a few short weeks — and few of us can hunt them all. The remainder of the bowhunter’s year is spent shooting at targets and waiting for the next season…or is it? For the serious bowhunter, there’s too much time between traditional hunting seasons, however, that gap can be closed by another archery season that, depending on the species and location, runs from March 1 to July 31. Most of us know it as bowfishing. But Greg Shieman, one of Ontario’s most experienced practitioners of the sport, says most of us don’t know it nearly well enough. “Though it hasn’t really caught on in Ontario like it has in the U.S., bowfishing is just about the most fun you can have,” said Shieman. He should know. 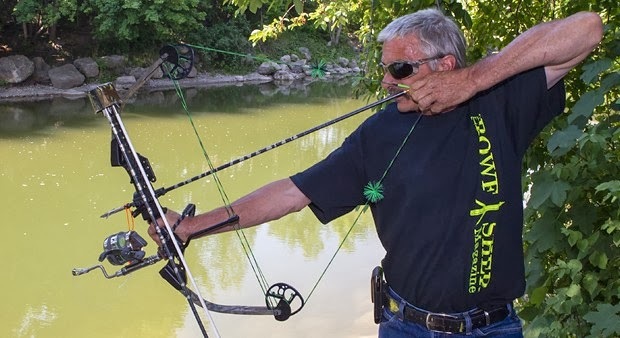 The 56-year-old Thamesville resident has bowfished extensively throughout the province and the U.S. for the last 40 years. He held the Mississippi state bowfishing record for white amur carp in 1998 and 1999, with 49.5- and 57-pound fish, respectively. He regularly fishes tournaments in the U.S. and he’s one of two Canadian representatives of the Bowfishing Association of America. Kevin Wheeler, 52, of Meaford, doesn’t need convincing. Though he has only been at it for three seasons, he has become a self-appointed ambassador for bowfishing and has introduced several people to the sport. Like Shieman, his enthusiasm is contagious. Even he’s surprised at how much he enjoys it. Contrary to what some believe, crossbow use for bowfishing is not allowed in the province at the present time. “Crossbows are not legal for bowfishing,” said Provincial Enforcement Specialist David Critchlow. Bill Embury, owner of Saugeen Shafts in Peterborough, says that once you have the bow, all you need is a bowfishing starter kit. These include a heavy barbed fishing arrow, a reel or spool, and line from 100- to 400-pound test. Most kits can be purchased for less than $50. “You need a threaded stabilizer bushing on your bow on which to screw a bowfishing reel. If your bow doesn’t have a bushing, you can buy reels or spools that you can strap or tape on,” he added. George Wagner of the Bow Shop in Waterloo sells a few starter kits each spring. So too does Dave Landsborough, owner of Triggers and Bows, out of Brantford. While any compound or traditional bow will do, it’s important to note that short-limbed bows are easier to handle when wading or in tight cover. The bow’s draw weight should be influenced by several factors. Bows set to 40 to 50 pounds are best suited to bigger fish, shots taken at fish deep in the water column, or at longer ranges. If you are wading creeks or marshes or fishing from a boat and taking shots at closer range, a bow drawing 20 to 30 pounds is more than adequate says Schieman. “A heavy bow can put arrows right through the fish, which is something you don’t want. Arrows that sail right through can get caught or stuck in something beyond the fish or hook onto something on the retrieve,” he said. Lighter bows are also less fatiguing, which is important since you can shoot lots of arrows on a good day. Typically, shots are within 15 feet when wading, shooting from creek banks, or a boat. When targeting cruising fish from a dock or pier, as Wheeler often does, shots rarely exceed 50 feet. “You really have a hard time shooting much farther because the arrows are heavy, they’re dragging line, and they have terrible, terrible trajectories,” said Shieman. As far as other gear goes, you don’t need much. Sunscreen, a long-sleeved shirt, and a hat are always a good idea when on the water, and don’t leave home without polarized fishing glasses. A bow fisher relies on them to see fish. If you choose to fish sandy bays or rivers or creeks, you might need waders to get close. Many shooters prefer to draw using bare fingers or no-glove finger savers (rubber attachments to your string make this more comfortable) rather than tabs, gloves or releases. Since most shooting is close and fast, sights provide no real advantage. Bowfishing is not complicated, but there are things you can do for greater success. First, you need to remember that refraction occurs when light rays meet water. Those bent light rays make a fish appear higher than it actually is — and that means your first instinct is to aim higher than required. “The biggest mistake all beginners make is not aiming low enough,” said Wheeler. Ideally, you should try to get as close as you can and hit the fish just behind the gill plate. The ideal day for bowfishing is sunny with no wind, so that fish are easier to see. On those days, you need to move slowly and try not to throw your shadow across your quarry, he says. One other tactic Wagner says is effective is positioning bowfishers to cover adjacent pools in rivers or creeks to move fish back and forth. Otherwise, the biggest challenge is spotting and hitting the fish. In Ontario, bowfishers can take carp and bowfin from May 1 to July 31 and white suckers from March 1 to May 31, depending on the fisheries zone, so check your local regulations. Prime time for each is during their spawning periods, when they come into shallower waters. Late spring, therefore, is prime time to bowfish for carp. “They are far less cautious during the spawn and the shots tend to be close,” said Shieman. Typically, they will cruise near the surface in shallower water at that time. White suckers make their spawning runs even earlier in the spring, and those runs might last for a month. Bowfins spawn later when water temperature hits 19°C. You can get them at other times, but during this period shooting is fast and furious. Wheeler has learned the value of knowing applicable laws because, often, enforcement agencies don’t have any experience with bowfishing. Remember that you need a fishing licence to bowfish, but you can only do so during daylight hours. In most other jurisdictions you are able to fish at night, so bowfishing videos shot outside of Ontario can be misleading. Bowfishing is a fast-paced and rough-and-tumble sport that’s not exactly for the faint of heart. When you’re reeling in a 20-pound carp that’s splashing and thrashing, this will immediately become apparent. Combine the thrill of the catch with the fact that you don’t have to travel far for a chance at arrowing fish, and you will understand why this sport is experiencing slow but steady growth. This spring, when you get bored with shooting at targets or you’re done chasing turkeys, consider taking your bow to the water. You’ll be glad you did.